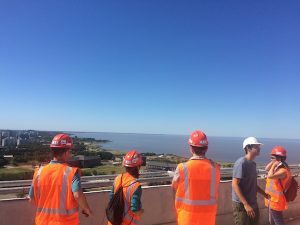 This morning the global leaders crew had the pleasure of joining MSGSSS, an Argentinian architectural firm, for a tour of Alrío complex in Vicente Lopez, Buenos Aires. Alrío is a mixed-use urban development composed by five luxury residential buildings, 2 office towers and a first class shopping center. Ribera Desarrollos, MSGSSS’s client for the project, has chosen to develop this complex over 40 acres of land strategically located in the intersection of Libertador Avenue and General Paz, which is close to main highways, surrounded by green spaces, and in front of the Río de la Plata. Alrío design was performed by MSGSSS, while its construction has been executed by Caputo, one of the most experienced and respected general contractors in Buenos Aires. As stated by one of MSGSSS partners, Carlos Sallaberry, the project has been progressing according to the possibilities of the economy. As we have learned in this past few days, political and economic instability have severe effects on most construction projects in South America and their influence often determine the pace at which these projects are executed. As seen in many cases, government changes, economic crisis, inflation and many other events often prevent both public and private projects from their successful completion. One of the most interesting aspects of the project is the design of “special units”, which are combinations of two or three regular units. These special units can be requested by buyers wishing both extra space and specific features. The cost of such special features would be then added to the initial price of the special unit through different change orders. 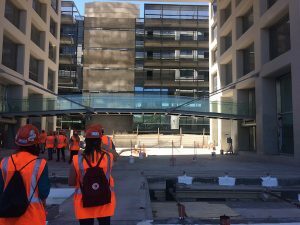 Another interesting point addressed at the site visit is the role of architectural firms in construction projects here in Argentina. In contrast to the usual responsibilities of American design firms, Argentinian design firms are much more involved in the execution of projects. 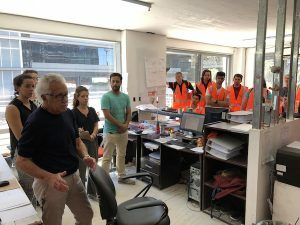 In the case of the Alrío complex, MSGSSS’s team of twenty professionals are constantly monitoring and supervising the construction from temporary offices distributed around the buildings. 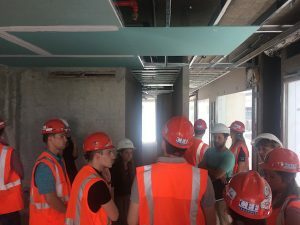 As explained by one of MSGSSS’s architects, their job usually transitions from the completion of the design to setting up offices on site to solve everyday problems. 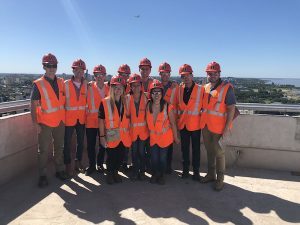 The team of architects and engineers on site are responsible for verifying that all the quality requirements are met, all the equipment and materials are correctly purchased and installed, and that all the specific features required by the clients are appropriately conducted.